Au jour J, le 06 juin 1944, débuta la plus grande bataille de la Seconde Guerre mondiale en Normandie. À l’heure H, 06 h 30 du matin 156 000 hommes dans plus de 1200 navires de guerre et plus de 4000 engins de débarquement se lancèrent à l’assaut des plages normandes. Pour cette première journée d’offensive les pertes humaines furent inférieures à 3%. En une semaine, plus d’un million de militaires enfoncèrent les défenses du mur de l’Atlantique commandées par le maréchal allemand Rommel. En tout, trois millions d’hommes débarquèrent en Normandie. Les alliés s’étaient garantis la suprématie de l’air grâce à 12 000 avions contre seulement 169 avions de chasse allemands. L’opération Neptune permit d’ouvrir un deuxième front face au front russe de l’Est de l’Europe. En effet, l’invasion de la Sicile par les forces alliées en juillet 1943 s’était avérée plus lente que prévue et n’affectait pas l’armée allemande. Adolf Hitler fut vaincu en Normandie par le commandement des forces alliées qui était assuré par le Général américain Dwight Eisenhower et le Maréchal anglais Bernard Montgomery. Le 06 juin 1944 se positionne à 24°56′ du Verseau. Ce degré du jour se trouve en Maison IV et conjoint à la Maison V. Il est attribué à Mercure (25°41′). Il est de force Moyenne. 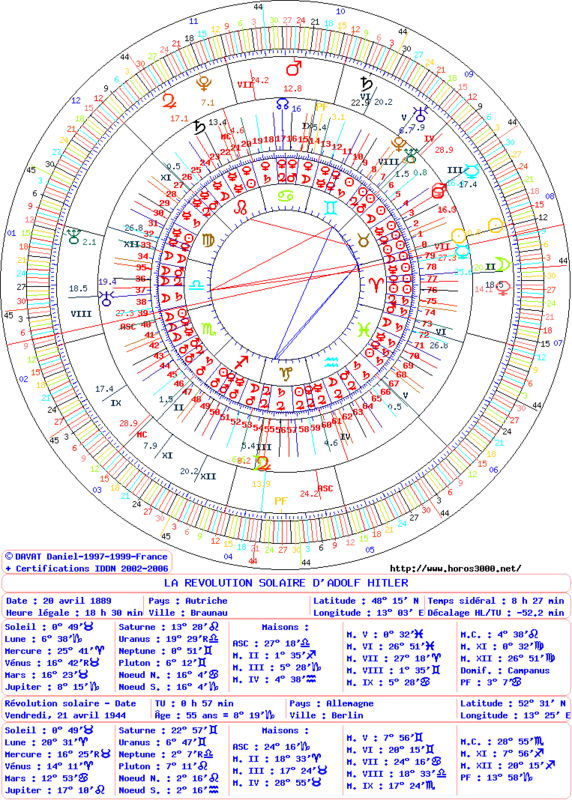 Le degré de l’année est situé à 8°53′ du Capricorne en Maison III. Il est conjoint à la Lune et à Jupiter. Il est de force Faible. À cinquante cinq ans et un mois, il annonce la période Jupiter-Saturne. Saturne est de qualité Très Maléfique en Lion son signe d’Exil et de force Très Puissante au Milieu du Ciel. Le maître de la période planétaire Saturne est de qualité Très Maléfique et de force Très Puissante au Milieu du Ciel. Par sa position culminante il est déterminant des échecs, des faillites et des déshonneurs. Les autres données sont soit de force Moyennes ou Faibles. Le 06 juin 1944 se situe à 23° du Verseau. Il est toujours de force Moyenne. Le degré de l’année se situe à 8°19′ du Capricorne. Il est en Maison XII de RS et III natale. Il est de force Puissante par sa conjonction à la Part de Fortune de RS. La période planétaire est celle de Jupiter-Saturne. Saturne destructeur comme maître de la période en Lion est la plus puissante énergie astrale et annonce le début de la fin du Troisième Reich. Pluton de RS se positionne au Milieu du Ciel natal et en Maison VII de RS, celle des conflits armés. Il est de force Très Très Puissante. En conjonction à Saturne natal, il est déterminant des bouleversements et des destructions en temps de guerre. 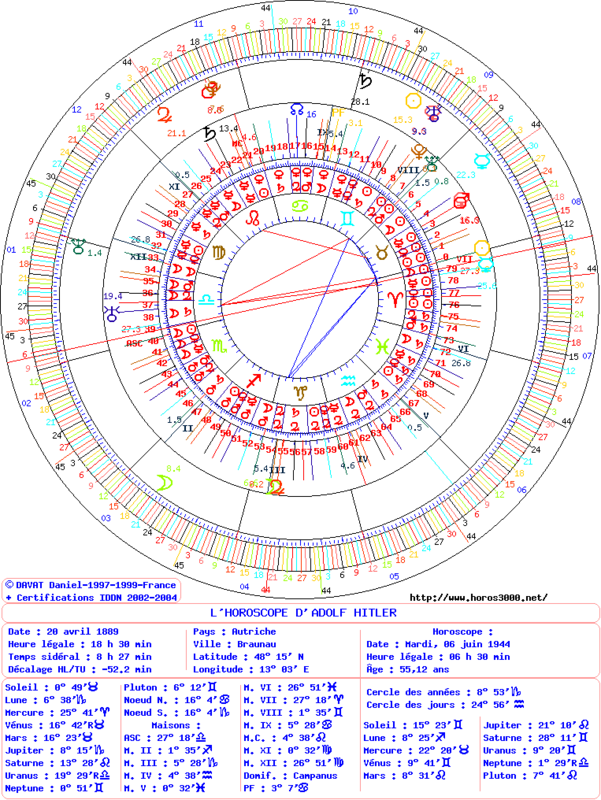 Les autres énergies astrales bénéfiques comme Jupiter de RS (conjoint à Saturne natal) et PF de RS (conjointe au degré de l’année) signifie que ce n’est pas encore le temps de la fin d’Hitler. Cet article a été publié le mardi 20 août 2013 à 15 h 15 min et est classé dans Adolf Hitler. Les commentaires et les pings sont actuellement fermés. On en redemande !!! de mon cote vous etes maintenant dans mes preferences a bientot. I just want to tell you that I am newbie to blogging and definitely liked your web-site. More than likely I’m planning to bookmark your site . You certainly come with outstanding well written articles. Regards for sharing your web-site. Is it fine to insert part of this in my website if I submit a reference point to this site? Answer of Daniel DAVAT: I allow to insert my RSS Flux. Answer of Daniel: It’s WordPress + free theme Aspire-fr. Odd , your posting turns up with a black color to it, what shade is the primary color on your web-site? This blog has got lots of very helpful info on it. Cheers for informing me. Is it okay to place a portion of this in my webpage if I submit a reference to this website? Nice post ! Thanks for, visiting this blog mate. Ill email you again. I didnt know that! It seems to me that this web site doesnt download on a Motorola Droid. Are other people getting the same issue? I enjoy this website and dont want to have to miss it any time Im gone from my computer. read in a little format. Hiya, I am really glad I’ve found this information. Nowadays bloggers publish only about gossips and internet and this is really irritating. A good blog with exciting content, this is what I need. Thanks for keeping this website, I’ll be visiting it. Do you do newsletters? Can not find it. Thank you for every other informative blog. Where else could I get that type of info written in such a perfect way? I’ve a undertaking that I am simply now operating on, and I’ve been on the look out for such information. Answer of Daniel: only on my web site! Is it okay to insert a portion of this in my webpage if I publish a reference point to this website? magnificent post, very informative. I wonder why the opposite specialists of this sector do not understand this. You must continue your writing. I am confident, you’ve a great readers’ base already! Could you email me with any pointers about how you made your blog site look like this, Id be appreciative. Thanks for the something totally new you have unveiled in your post. I was real been redolent of this particular website by simply my cousin. I am located uncertain whether this particular pole survives compiled by him having the status of minion different see like allocated on my turmoil. You happen to be great! Just discovered this site through Google, what a pleasant shock! I would like to thnkx for the efforts you have put in writing this blog. I am hoping the same high-grade web site post from you in the upcoming also. Actually your creative writing abilities has inspired me to get my own blog now. Really the blogging is spreading its wings rapidly. Your write up is a good example of it. I was fantastically contented to attain this web-site.I sought after to thanks for your calculate representing this brilliant read!! I beyond doubt enjoying all insignificant fragment of it and I have you bookmarked to check not on new to the job gear you blog post. Woh Anyone tendernesses people , bookmarked ! My associate next i accompany installment within your last sense. I will immediately seize your rss as I can’t in finding your e-mail subscription link or newsletter service. Do you’ve any? Please let me recognise in order that I may subscribe. Thanks. WOW I always thought this topic. I will be bookmarking this link to my family! Thank you for this blog. I am excited to hear from you in the future. I simply had to appreciate you once more. I do not know the things that I could possibly have done without these creative ideas discussed by you relating to such situation. It had become a very challenging condition in my view, but finding out this well-written fashion you processed that forced me to leap with fulfillment. Now i am grateful for this assistance and have high hopes you are aware of an amazing job you happen to be putting in training the rest by way of your web site. I am certain you’ve never encountered all of us. I simply preferred to point out many thanks throughout once again. I am actually unsure the things that I could have created to occur in the lack of these ways disclosed by you on that complication. This was actually before a troublesome setup when it comes to me directly, however discovering this professional design you fixed the concern created myself to leap over delight. I am simply pleased when it comes to this services and also, get higher chances you know a highly effective task you have actually been performing training the mediocre ones with your web blog post. Greater than likely you haven’t come across any of us. I have been examinating out many of your articles and i can state clever stuff. I’m extremely inspired along with your writing abilities as neatly as with the layout for your blog. Is that this a paid theme or did you customize it your self? Anyway stay up the excellent quality writing, it is rare to peer a nice blog like this one these days..
A interesting blog post right there mate ! Thank you for posting . Mate! This blog site is cool. How do you make it look like this ! I Am Going To have to come back again whenever my course load lets up – however I am taking your Rss feed so i could go through your site offline. Thanks. Please email me with some hints & tips about how you made this site look like this, I would be appreciative. I must show some thanks to the writer for rescuing me from such a instance. As a result of looking throughout the the net and getting advice which are not pleasant, I figured my entire life was over. Living devoid of the strategies to the problems you have resolved all through your good post is a critical case, as well as ones that might have badly damaged my entire career if I hadn’t discovered your site. Your good talents and kindness in handling almost everything was crucial. I’m not sure what I would have done if I hadn’t come upon such a point like this. I can at this point look forward to my future. Thanks for your time so much for this professional and effective help. I won’t be reluctant to propose your web blog to any person who needs to have direction on this subject matter. hi!,I really like your writing very so much! percentage we communicate extra about your post on AOL? I require an expert on this area to solve my problem. Maybe that is you! Looking ahead to see you. A insightful post right there mate . Cheers for posting . Freakin awesome issues here. I am very happy to peer your article. Thank you a lot and i’m looking forward to contact you. Will you please drop me a mail? Hello, I just hopped over to your site using StumbleUpon. Not somthing I would normally read, but I appreciated your thoughts none the less. Thanks for creating something worth reading through. This website is very good! How did you make it !? How did you make a blog look this good! Email me if you want and share your wisdom. Id be appreciative! My spouse and I absolutely love your blog and find many of your post’s to be just what I’m looking for. Does one offer guest writers to write content for yourself? I wouldn’t mind writing a post or elaborating on most of the subjects you write concerning here. Again, awesome weblog! I love this website layout ! How did you make it!? It is really good! How did you make your blog site look this cool! Email me if you want and share your wisdom. Id be appreciative! Hello! I could have sworn I’ve been to this blog before but after checking through some of the post I realized it’s new to me. Anyways, I’m definitely happy I found it and I’ll be bookmarking and checking back frequently! I not to mention my pals appeared to be going through the nice guides from the website and so before long came up with a horrible suspicion I had not expressed respect to the blog owner for those secrets. My people happened to be excited to read through them and now have in actuality been taking pleasure in those things. I appreciate you for genuinely indeed thoughtful and then for selecting these kinds of really good resources millions of individuals are really needing to understand about. Our sincere regret for not expressing gratitude to earlier. Very interesting information!Perfect just what I was searching for! « I myself do nothing. The Holy Spirit accomplishes all through me. » by William Blake. Answer of Daniel: Wonderful William Blake! Sorry for my bad English.A person essentially assist to make critically posts I’d state. That is the very first time I frequented your web page and up to now? I surprised with the analysis you made to create this actual publish incredible. Wonderful job! I should admit that your post is actually fascinating. I have spent lots of my spare time reading your content. Thank you a good deal! Spot on with this write-up, I in fact assume this web page wants much a lot more consideration. in all probability be once again to read way additional, thanks for that info. We’re a group of volunteers and opening a new scheme in our community. Your web site provided us with useful info to operate on. You’ve got accomplished an outstanding job and our whole neighborhood will likely be thankful to you. Me and my close friend were arguing about an issue very similar to this! Now I know that I was right. lol! Appreciate it for the information you blog post. My kind regards, Maris. I’ve recently started a web site, and the info you provide on this website has helped me tremendously. Thanx for all of your time & work. Ça a l’air délicieux grand chef féérique! I am not very fantastic with English but I line up this quite effortless to translate. I precisely wished to say thanks all over again. I do not know the things I would have carried out in the absence of the entire basics documented by you concerning my problem. It actually was the scary problem for me, but being able to view the specialized fashion you processed it took me to weep for delight. Now i’m grateful for the support and as well , have high hopes you are aware of a great job that you are carrying out instructing many people through your website. Most probably you have never encountered any of us. I like this web blog so much, saved to fav. « I don’t care what is written about me so long as it isn’t true. » by Dorothy Parker. Iˇm not sure where you’re getting your information, but great topic. I must spend a while studying much more or understanding more. Thanks for magnificent information I was searching for this info for my mission. Thanks for the sensible critique. Me & my neighbor were just preparing to do some research on this. We got a grab a book from our local library but I consider I learned extra clear from this post. I’m quite glad to see such superb info being shared freely out there. That’s the fitting weblog for anybody who needs to find out about this topic. You understand a whole lot its virtually exhausting to argue with you (not that I actually would want…HaHa). You undoubtedly place a brand new spin on a topic thats been written about for years. Good stuff, just wonderful! Wow, fantastic weblog structure! How long have you been running a blog for? you made running a blog look easy. The entire glance of your site is wonderful, as neatly as the content! Following research just some with the blog posts on your site now, and I genuinely like your method of blogging. I bookmarked it to my bookmark web site list and can be checking once again soon. Pls check out my internet site as properly and let me know what you feel. Answer of Daniel: there is no music on my blog! I randomly browse blogs on the net, and i find out your post to be really informational. I even have currently bookmark it on my browser, so as that I will view your website publish all over once more later. On top of that, i’m wondering no matter if or not or not your weblog is open for link exchange, as i genuinely require to trade links with you. I usually do not usually do that, however I hope that we’re going to have a mutual hyperlink exchange. Let me grasp and have an ideal day! I am commenting to let you be aware of what a wonderful discovery our daughter found checking your web site. She came to understand many issues, including what it is like to possess a marvelous coaching mindset to get other folks smoothly have an understanding of specified grueling subject areas. You really exceeded visitors’ expected results. Thanks for producing those invaluable, healthy, educational and as well as easy tips on that topic to Julie. hello!,I like your writing pretty a lot! share we communicate much more about your article on AOL? I will need a specialist on this location to resolve my dilemma. May be that is you! Searching forward to determine you. Wow, superb blog layout! How long have you been blogging for? you make blogging look easy. The overall look of your web site is excellent! Very interesting details you have observed , regards for posting . « Custom is the great guide of human life. » by David Hume. Thank you for sharing superb informations. Your web site is so cool. I am impressed by the details that you have on this blog. It reveals how nicely you perceive this subject. Bookmarked this web page, will come back for more articles. You, my pal, ROCK! I found simply the information I already searched all over the place and simply could not come across. What an ideal web-site. A lot of thanks for your whole effort on this web site. Kim loves participating in research and it’s easy to understand why. I learn all about the compelling medium you offer very important techniques via the blog and even strongly encourage participation from other individuals on that area so our princess has been learning a whole lot. Enjoy the rest of the new year. You’re the one carrying out a brilliant job. I’m curious to discover out what website platform you happen to be using? I’m possessing some little security challenges with my most current web site and I’d like to locate a thing a lot more risk-free. Do you may have any solutions? Caution should think carefully! Don’t forget that when you’ll travel! I as well as my pals were found to be viewing the best tips from your web site then then I had a horrible feeling I had not thanked the web site owner for those techniques. These ladies had been as a consequence thrilled to read them and now have seriously been enjoying these things. Thanks for really being really helpful and also for picking out such high-quality guides millions of individuals are really wanting to discover. My very own honest regret for not saying thanks to earlier. I precisely wished to thank you so much once again. I am not sure the things that I could possibly have gone through without the type of tips and hints documented by you relating to my topic. Entirely was a very depressing setting for me, however , taking note of a skilled mode you dealt with the issue made me to weep over happiness. Extremely happier for this support and thus trust you comprehend what an amazing job that you’re carrying out training most people all through your website. More than likely you haven’t got to know all of us. I love this info presented and possesses given me some type of resolve forpersistance to succeed i genuinely enjoy seeing, so sustain the superb function. My spouse and i have been absolutely thankful that Louis managed to round up his preliminary research through the entire ideas he grabbed while using the blog. It’s not at all simplistic to just find yourself freely giving thoughts which often people might have been trying to sell. And we all know we need you to give thanks to because of that. Most of the explanations you made, the easy blog navigation, the friendships you help to engender – it’s many fantastic, and it is aiding our son in addition to the family recognize that that situation is entertaining, and that is exceedingly important. Many thanks for everything! I like the valuable info you provide for your articles. I’ll bookmark your weblog and check again right here frequently. I am quite sure I will be informed many new stuff proper right here! Good luck for the following! I actually wanted to jot down a brief remark to be able to express gratitude to you for all of the splendid items you might be posting right here. My incredibly extended net investigation has at the end been compensated with reasonable points to exchange with my colleagues. I would tell you that numerous of us readers essentially are undeniably lucky to exist in a remarkable site with numerous perfect folks with really helpful tips. I really feel definitely grateful to have used your entire website and appear forward to some much more fantastic minutes reading right here. Thank you once again for any great deal of things. matter but generally people don’t talk about such topics. I conceive this internet site contains some real fantastic info for everyone :D. « We rarely think people have good sense unless they agree with us. » by Francois de La Rochefoucauld. I’m actually enjoying the style and layout of your weblog. It is a really uncomplicated on the eyes which tends to make it a lot additional pleasant for me to come right here and visit much more typically. Did you employ out a developer to make your theme? Fantastic operate! This has to ensue fantastic website, would you be thinking about responsibility an interview concerning merely how you produced it? If thus e-mail me! Just thought I need to leave a short comment saying thank you for your tough work and work putting all this data collectively. A few of us appreciate it. I read this website and I believe you have a lot of excellent info to share. I have saved to fav and will review again later today. I was examining some of your posts on this website and I think this internet site is real informative! Keep on putting up. Your method of explaining the whole thing in this paragraph is really pleasant, every one be able to without difficulty be aware of it, Thanks a lot. I have been gone for a while, but now I remember why I used to love this site. Thanks, I will try and check back more frequently. How often do you update your blog? I do agree with all of the ideas you have offered for your post. They’re really convincing and can certainly work. Still, the posts are very short for starters. Could you please extend them a bit from subsequent time? Thanks for the post. I’m so excited I came athwart your blog site! I didn’t believe I would ever stumble on anybody who agrees with my opinions as a lot as you do. Hello.This article was extremely remarkable, particularly because I was looking for thoughts on this subject last Wednesday. I would like to thank you for the efforts you’ve put in writing this web site. I’m hoping the same high-grade web site post from you in the future as well. Actually your creative writing abilities has encouraged me to get my own website going now. Really blogging is spreading its wings and growing quickly. Your write up is a great example. whoah this weblog is fantastic i really like studying your articles. Stay up the good paintings! You recognize, a lot of persons are searching round for this info, you could aid them greatly. I have been reading out quite a few of the articles and i can claim fairly good stuff. I will ensure to bookmark your internet site. hi!,I love your writing very much! percentage we keep in touch more approximately your article on AOL? I need an expert on this area to resolve my problem. Maybe that is you! Having a look forward to look you. Great ?I should certainly pronounce, impressed with your web site. I had no trouble navigating through all the tabs and related information ended up being truly easy to do to access. I recently found what I hoped for before you know it in the least. Quite unusual. Is likely to appreciate it for those who add forums or something, website theme . a tones way for your client to communicate. Excellent task. Quite efficiently published info. It is going to be supportive to anybody who make use ofs it, which include myself. Hold up the good get the job done – for confident i will take a look at additional posts. Hi there, just turned alert to your web site using Research, and discovered that it’s really helpful. Our team acquired a great e manual on that concern through our original collection and the majority of manuals the place not since influensive as your info. I am actually extremely glad to see such info which I used to be actually browsing for a protracted time. This made very thankful! I really like your writing style, superb information, regards for posting :D. « In every affair consider what precedes and what follows, and then undertake it. » by Epictetus. Generally I do not learn article on blogs, but I would like to say that this write-up very pressured me to check out and do it! Your writing style has been surprised me. Thanks, quite nice post. great publish, very informative. I wonder why the other experts of this sector don’t understand this. You should continue your writing. I’m sure, you’ve a huge readers’ base already! you’re really a good webmaster. The site loading speed is amazing. It seems that you’re doing any unique trick. Also, The contents are masterwork. you have done a wonderful job on this topic! Hi, Neat post. There’s an issue together with your web site in internet explorer, could test this… IE still is the marketplace leader and a big component to other people will miss your fantastic writing due to this problem. I do believe all of the ideas you have presented on your post. They are very convincing and will certainly work. Nonetheless, the posts are very short for beginners. Could you please extend them a little from subsequent time? Thanks for the post. I’m extremely pleased to uncover this website. I wanted to thank you for your time, and for this excellent study – I definitely appreciated every single bit of it, and already have you book marked to check out new stuff. May I just say what an enjoyment to find someone that really understands what they are discussing on the web. You have realized how to bring an issue to light and make it important. % to force the message home a little bit, however other than that, that is fantastic blog.